All of your favorite characters—Cinderella, Little Red Riding Hood, Jack (and his beanstalk), and the Witch—meet and interact in this whimsical original story. The musical centers on a baker and his wife who wish to have a child; Cinderella, who wishes to attend the king's festival; and Jack, who wishes his cow would give milk. When the baker and his wife learn that they cannot have a child because of a witch's curse, the two set off on a journey to break the curse and wind up changed forever. Kristi is fourteen and in 9th grade at Saint Edward’s School. Some RCT credits include Peter Pan Jr., Legally Blonde Jr., You’re a Good Man Charlie Brown, and Xanadu. Kristi played young Cosette in Les Miserables on the mainstage at Riverside Theatre. She has been selected by iTheatrics in NYC to be part of their choreography DVD for three years. Kristi aspires to be on Broadway and attend NYU Tisch. Thanks to her family and directors for their positive support and guidance! Trinity is in 6th grade at Sebastian River Middle School. Previous shows at RCT include A Christmas Carol, Sleepy Hollow, Wish, and Annie. Her favorite book series is The Magic Tree House. Special thanks to her family and friends. Kyla is twelve years old and attends Imagine South Vero Middle School. She has taken summer camps and performed in iRascals over the years. 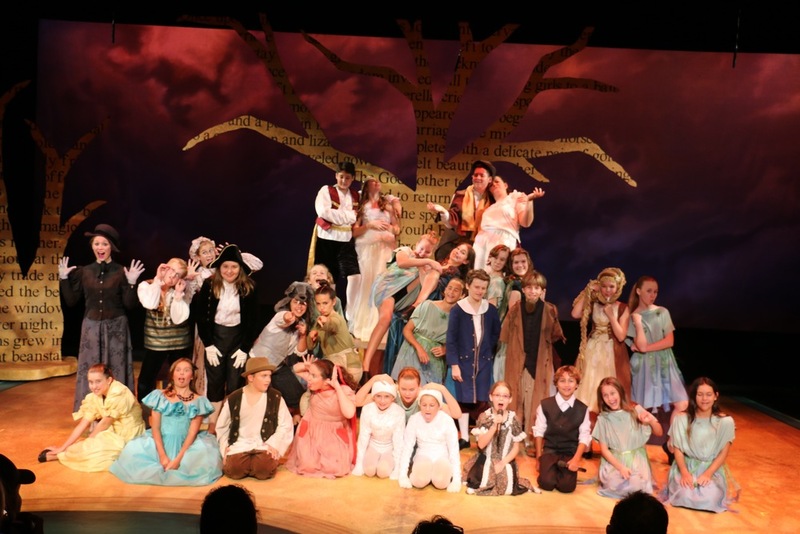 She was lucky enough to be a part of Sleepy Hollow and Alice in Wonderland at RCT. She would like to thank the coaches and Kevin for making this fun. David attends St. Helen School and loves to sing and act. He has been in Peter Pan Jr. and this show at RCT. His favorite sports are basketball, volleyball, and soccer. He loves books, to sketch, and to color. Michala is in 8th grade at St. Helen’s School. Her favorite shows at RCT are Peter Pan Jr., Schoolhouse Rock: LIVE!, and Mulan. She hopes to play volleyball at Duke University, but she also wants to become a surgeon and save lives. Joy is an eleven year-old homeschooled student. She loved participating in Frog and Toad Kids (Homeschool Schoosical) as well as Lion King Kids this past spring and summer. She loves doing shows at RCT and her other interests include lacrosse and cardmaking. She wants to say thank you to Debbie for the amazing musical instruction and to Kevin for the creative directing. Caleb is a 6th grader attending Imagine South Vero. He really enjoys acting and dreams of becoming a Broadway or movie actor. His past credits at RCT include You’re a Good Man Charlie Brown, Lion King Kids, and iRascals. He also enjoys soccer, tennis, swimming, and running. He would like to thank his RCT teachers for giving him this opportunity. He would also like to thank his family and friends for their support. But most of all, he would like to thank God, who makes everything possible. Kayleigh is a 7th grader at Olivet Private School. She enjoys trips to Disney with her family. Besides theatre, Kayliegh also enjoys Irish dance, tap, and figure skating. She can’t wait to be in another show! Victoria has been in six shows at RCT and loves hanging out with her friends, learning the music, and then blocking. Special thanks to Carrie for all her hard work, and also Kevin, Debbie, and the cast for putting on a fantastic show! Angelina is attending Gifford Middle School. She is eleven years old and hopes to be an actor when she grows up. She would like to thank RCT for all they do for kids. Graham attends Osceola Magnet and is in the 4th grade. He really enjoys being a part of the theatre. He is planning to be an actor. He would really like to attend NYU when he grows up. Graham is thrilled to be in his first play. Melanie is a senior at Indian River Charter High School. She is currently training for the role of Aldonza/Dulcinea in Man of La Mancha, a show to be performed at IRCHS in February. She is proud that her RCT experience has come full circle, with Into the Woods Jr. being her first RCT audition and last RCT performance. She would like to thank her parents and her boyfriend, Christian, for their love and support. She would especially like to thank Kevin and Debbie for these wonderful years of education and encouragement. Without you, she would not be the confident and versatile performer she is today. Jessica attends Sebastian River Middle School and is in the 8th grade. This is her first play at RCT, and she is very excited to be in the show. She hopes to be a Costume Designer or a professional actor one day. She would like to give a special thanks to RCT for allowing her to be in the play. Katie is ten years old and attends Imagine South Vero. 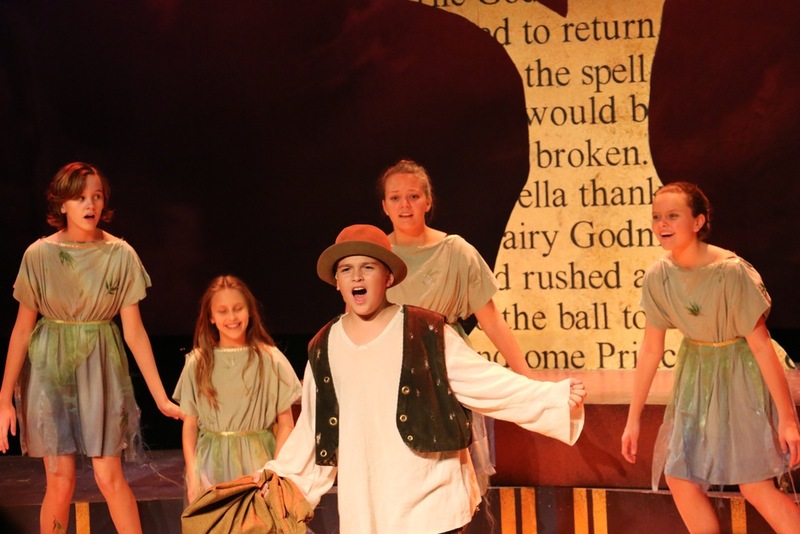 Previous shows include A Christmas Carol, Alice in Wonderland, and Peter Pan Jr. She has been doing camps at RCT since she was four years old and loves it here. She would like to thank all of her family, friends, and directors for their support. Harrison is eleven years old and is in the 6th grade at Saint Edward’s School. RCT credits include Sleepy Hollow, A Christmas Carol, Magic Treehouse, Charlie Brown, Mulan, Peter Pan, and Lion King KIDS. Harrison enjoys acting, playing the piano, and singing. Special thanks to his Parents, Kevin, Debbie, and The RCT Family. Lily is a 6th grade student at Saint Helen Catholic school. Her past roles include Young Louise in Gypsy at The Theatre Guild, Thumbelinas Mother at Frenchwoods Performing Arts Camp, Top Junior Vocalist at Blue Star singing contest, and she was selected to sing at I Sing to End Homelessness in Orlando. 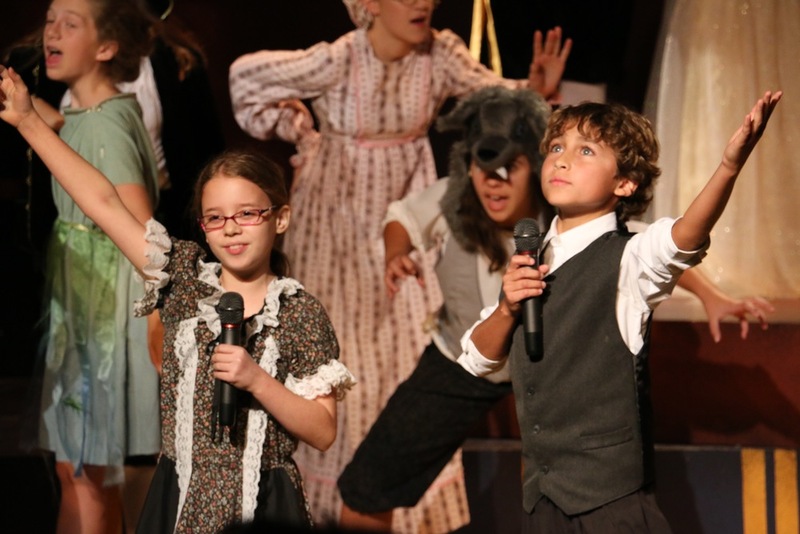 She has participated in Broadway Kids Auditions in New York City during the summer 2015 through BKA workshops. She thanks her parents and grandparents for their support and in providing her with lessons to pursue her love of music and acting. Chloe is thirteen years old and is in 9th grade at Storm Grove Middle School. She hopes to become an actress or a singer when she grows up. She enjoys playing tennis, coming to the theatre, and teasing her brother. Her favorite shows at RCT are The Little Mermaid Jr., The Twits, and Shrek the Musical. She would like to thank her mom and brother for all their support. Abigail is eleven years old and in the 6th grade at Saint Edward’s School. Some of her favorite shows are Sleepy Hollow, Godspell, and Annie. She would like to thank her parents and the director for supporting her. Hailey is in 7th grade at Imagine School South Vero. She has performed in You’re a Good Man Charlie Brown and this is her second production. She would like to thank her parents for always supporting her and RCT for giving her this opportunity. Zane is a 9th grader at the Freshman Learning Center. Some of Zane’s favorite past shows include Smile, Schoolhouse Rock: LIVE!, You’re a Good Man Charlie Brown, Shrek, and Peter Pan. Zane would like to thank his RCT family and his real family as well. Charolette, an eleven year old, homeschooled, 6th grader, is very excited to be in this show. Favorite shows include A Christmas Carol, Dinosaurs Before Dark, Annie, and Frog and Toad. She would like to thank her friends and family for their support and the RCT staff for this opportunity. Alison is eleven years old and in 6th grade at Saint Edwards. Her favorite shows that she has been in include Christmas Carol, Godspell Jr., Dinosaurs Before Dark, Peter Pan Jr. and Lion King Jr. Alison loves to perform and dreams of being on Broadway. Thanks to Kevin, Debbie and her parents. Graham is in the 9th grade and loves theatre. He has been in You’re a Good Man Charlie Brown, Dinosaur’s Before Dark, and Peter Pan Jr. He would like to thank RCT, his brother and his great parents. Emily is in the 7th grade at Storm Grove Middle School. Her favorite shows that she has been in are Mulan Jr., Alice in Wonderland, The Nutcracker: in Swingtime!, and The Cat in the Hat. She would like to thank Kevin and Debbie for being incredible directors. Holly a home school student, is now in her fourth play at RCT. Her hobbies are reading, swimming, and playing piano. She enjoys board games with her grandparents. Fish are her favorite animal. Her favorite stories are Spiderwick Chronicles, The Plant That Ate Dirty Socks, and Star Wars. Cristina is in 7th grade at St. Edward’s School. She has been in over fourteen shows at RCT. Some of her favorites are Wish, Godspell, A Christmas Carol, and Sleepy Hollow. She is thankful for all of her family’s love and support. Mackenzie is a junior at John Carroll High School. She is hoping to attend college in New York in a few years while majoring in musical theatre. Some of her favorites shows she has done here have been; Flat Stanley, Smile, Thumbelina, Wish, Christmas Carol, Annie, Alice in Wonderland, and High School Musical. She enjoys spending time with her friends, reading, and volunteering her time Stage Managing and Sound. She also would like to give a special thanks for her parents who are always there for her and support/help her with anything she does! She really appreciates them and all they do! Bailey is in the 5th grade at Osceola Magnet School. She has been involved with RCT since 2011. Acting, singing, and dancing are her passions. Some of her favorite shows that she has been in are Annie, Wish, Charlie Brown, The Little Mermaid, and Cat in the Hat. Special thanks to her family, friends, and the Theatre family. Peter is in the 7th grade at Gifford Middle School. He has been in many shows at RCT including Peter Pan, The Wiz, The Little Mermaid, and Godspell. He enjoys singing, acting, football, and playing sports. He would like to be the running back for the Green Bay Packers. Thanks to Kevin and Debbie for making RCT such a fun place to be. Sophie has previously been in Peter Pan Jr., Alice in Wonderland, and iRascals at RCT. She loves acting and singing and hopes to be in more productions at RCT. 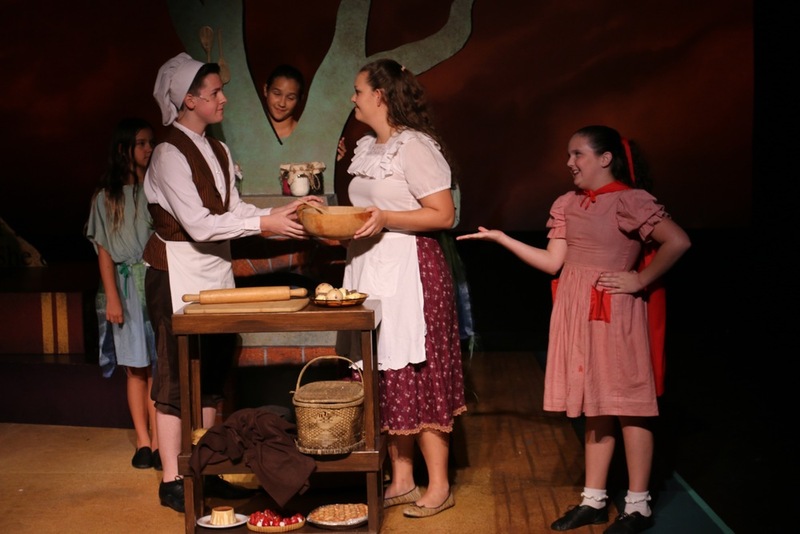 Participating in Into the Woods Jr. has been a fun and interesting experience for her. She would like to thank her parents for their support. Alexandra is seventeen and going into her senior year at IRCHS. She has been in thirteen shows at RCT, her favorites being Smile!, A Christmas Carol, and Schoolhouse Rock: LIVE! She would like to thank Kevin and Debbie, and her family for all their love and support.